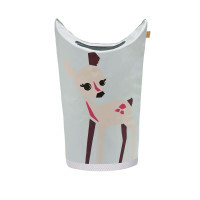 Dirty cloths can be put in one of the LASSIG laundry bag little tree fawn which are not only very functional, but also adorable with their animal designs. Product information "Laundry Bag kids, Wildlife Little Tree Fawn"
description & equipment When your child's room is mostly buried beneath all their clothes, the adorable LÄSSIG laundry bags step in with the perfect solution. The laundry bag wildlife meerkat with convenient handles have plenty of room for socks, shirts and pants. Folding down the two handles reveals an oval opening for depositing laundry. The handles can be lifted back up easily when it's time to carry the bag to the washing machine. 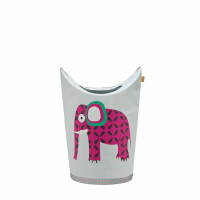 Adorable animal designs motivate even the smallest child to throw their laundry in the bag. This washable laundry bag is collapsible and can be packed away easily when not in use. For this laundry bag, 12 PET bottles were recycled.